It’s an understatement to say there’s a lot riding on the success of Star Trek: Discovery. It’s the first Trek TV series to premiere since the cancellation of Enterprise back in 2005. It’s arriving in the wake of the controversial J.J. Abrams pseudo-reboot films many fans have critiqued as veering away from many of the qualities that have defined Trek over its 50-year history. And it’s the flagship original series for the CBS All Access streaming service, the first show that has a shot of really putting All Access on the map. (With apologies to The Good Fight, Star Trek it ain’t.) Among those who have high hopes for Discovery‘s chances, and what that would mean for All Access, is CBS Interactive President Marc DeBevoise. In a new interview with Decider, DeBevoise says he hopes Discovery will not only be a hit, but will help drive CBS All Access to 4 million subscribers by 2020. As of February 2017, All Access was sitting at around 1.5 million subscribers. That’s a significant jump, but certainly not impossible…assuming Discovery proves a worthy successor to Gene Roddenberry’s legacy. There are millions of loyal Trek fans who’ve been eagerly awaiting a return to form — and to television — for Star Trek. But first it’s got to prove good enough not only to build positive buzz, but to entice fans to actually open their wallets and pay for yet another streaming subscription service. We’re at peak TV with 400 or 500 shows a year, so getting through with anything is hard. We’re constantly looking for what will resonate with consumers. Sometimes that an existing property, and sometimes that’s something new. Shows that come with a history are still new. If you’ve seen the trailer for Star Trek: Discovery, you can see that Soniqua Martin-Green is a unique star and you see a show that’s going to look different and feel different than anything that came before. Star Trek: Discovery is set roughly a decade before the events of The Original Series that introduced the world to Kirk, Spock, and McCoy. 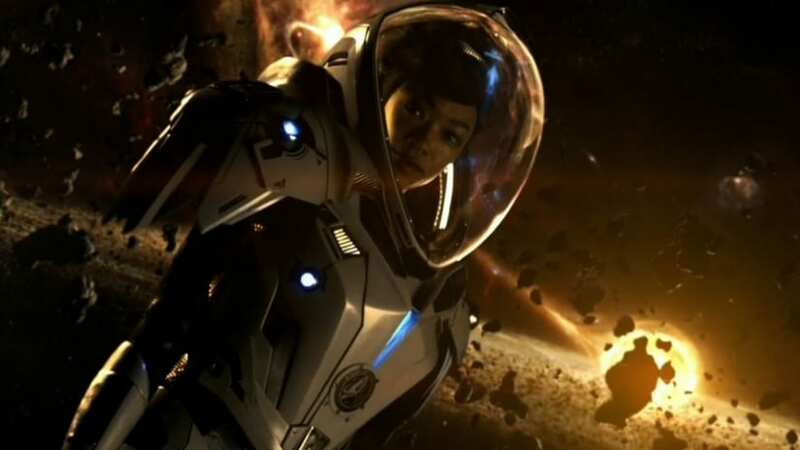 Discovery follows Michael Burnham (The Walking Dead‘s Sonequa Martin-Green), first officer of the titular verssel, serving under Captain Lorca (Jason Isaacs). While plot details are still scarce, we know the crew of the Discovery will be following the standard Trek tradition of boldly going where none have gone before, and that some of those journeys will bring them into conflict with Klingons. Discovery will be much more serialized than previous Trek series, telling one overarching story throughout its first season. The cast also includes Doug Jones (Hellboy), Michelle Yeoh, James Frain as Spock’s father Sarek, and Rainn Wilson (The Office) as fan-favorite Harry Mudd. Star Trek: Discovery will premiere September 24 on CBS, with the second episode immediately to be available on CBS All Access that night, and all subsequent episodes debuting exclusively on All Access. Here’s hoping it lives long and prospers.